The viewing options for sports bettors were once definitely limited. Thankfully, with improvements to internet connection loading times, and to devices in which bettors access such content, it is now the norm for them to watch live sports video streams and bet on the go as the action unfolds before their eyes. It is the straightforward math that has almost all betting websites and land-based shops invested in choosing and delivering live video streaming! What is important is that when choosing a live video streaming provider for your sportsbook, you take the time to find the effective combination of technology, coverage and price. The first step in providing live streams from sports venues or casino studios is just that – making sure that the experience is not interrupted by slow buffering! In an article by Streaming Media, WebRTC is described as technology that ‘holds tremendous promise for adding interactivity and reducing latency in streaming video’. Now more and more sports data providers, among which is FeedConstruct, opt for this protocol. Professionals believe Flash is dying. While modern browsers tend to limit its use, along with Adobe’s plan to reach Flash’s end-of-life by the end of 2020, others, MPEG-DASH and HLS implementations typically have latency limitations. Equally importantly, CDNs (Content Delivery Network) are being chosen over RTMP (Real Time Messaging Protocol) that has supported streaming for betting services. · avoid tangible financial losses because of tweets and posts on social media. People like to post about events such as a goal on social media and often it happens earlier than a betting website or a shop will show it. · deliver consistent low latency to your players regardless of the device they access the data on. For online casinos, low latency speeds play with more dealing rounds and increased revenue. 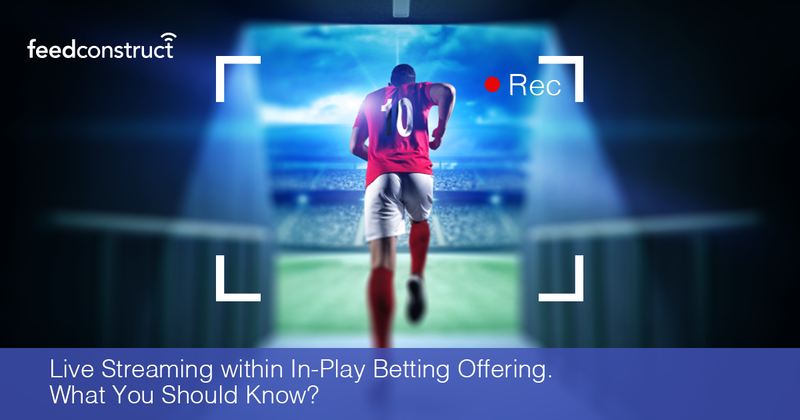 Adding statistics and commentary in live streams within your in-play betting offering you help bettors make sophisticated choices. Equally important, the technology used and website structure should be user-friendly so that players can move seamlessly between the live video and a detailed statistical overview of the game. Live streams with live odds additionally entice bettors into placing more bets. They are more likely to stay longer on your website, follow events from a single source directly connected to your live odds and make bets. This also brings about greater trust between you and your players as they become sure they receive content, be it odds or live video, as real-time as possible with no delay. Increasing the visit duration on your website or in the betting shop you also increase your chances to cross sell between online slots and table games with sports betting, especially football betting. This is an effective strategy that has been increasingly adopted by lots of well-established online casinos. Your focus is probably to offer more content in more depth and breadth - find ways to offer events from multiple sports, regions and continents. Live coverage of popular sports, such as football, tennis, basketball and ice hockey will have your players happy and excited. However, going beyond by delivering other sports like squash by PSA or local sport events will translate into an increased revenue for your betting business. For bettors, just like with supermarkets or shopping centers, the logical starting point is the variety, namely the number of sports and betting markets accessible live at each bookmaker. Complementing the amount of events available is the variety of bets that can be placed upon them, from quick-fire bets, like next goal or points scorers, to multiple original in-play bets. Live streaming on your website will transform player experiences into exciting moments.